Pistols for sale at Target Masters, an indoor shooting center, in Garland, Texas on March 3. 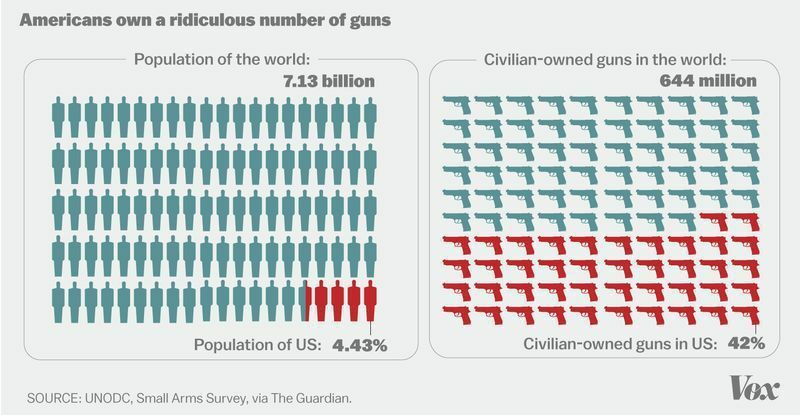 This chart, compiled using United Nations data collected by Simon Rogers for the Guardian, shows that America far and away leads other developed countries when it comes to gun-related homicides. Why? 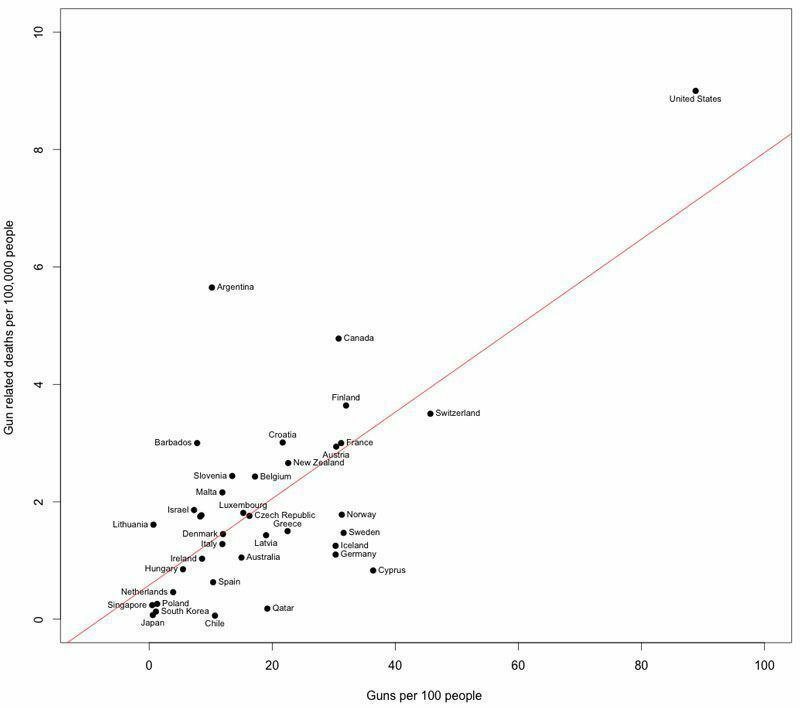 Extensive reviews of the research by the Harvard School of Public Health’s Injury Control Research Center suggest the answer is pretty simple: The US is an outlier on gun violence because it has way more guns than other developed nations. In December 2012, a gunman walked into Sandy Hook Elementary School in Newtown, Connecticut, and killed 20 children, six adults, and himself. 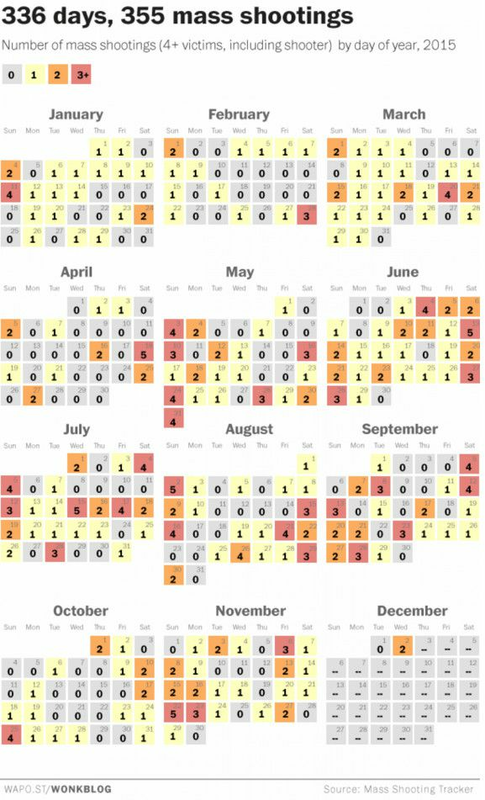 Since then, there have been at least 1,518 mass shootings, with at least 1,715 people killed and 6,089 wounded. The counts come via the Gun Violence Archive, which has hosted a database that tracks mass shootings since 2013. But since some shootings go unreported, the database is likely missing some, as well as the details of some of the events. The tracker uses a fairly broad definition of “mass shooting”: It includes not just shootings in which four or more people were murdered, but shootings in which four or more people were shot at all (excluding the shooter). Even under this broad definition, it’s worth noting that mass shootings make up a tiny portion of America’s firearm deaths, which totaled more than 33,000 in 2014. Whenever a mass shooting occurs, supporters of gun rights often argue that it’s inappropriate to bring up political debates about gun control in the aftermath of a tragedy. For example, former Louisiana Gov. Bobby Jindal, a strong supporter of gun rights, criticizedformer President Barack Obama for “trying to score cheap political points” when Obama mentioned gun control after a mass shooting in Charleston, South Carolina. But if this argument is followed to its logical end, then it will never be the right time to discuss mass shootings, as Christopher Ingraham pointed out at the Washington Post. 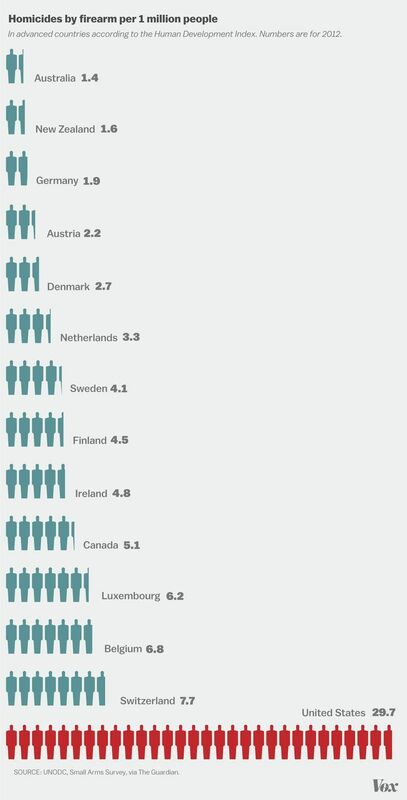 Under the broader definition of mass shootings, America has nearly one mass shooting a day. So if lawmakers are forced to wait for a time when there isn’t a mass shooting to talk gun control, they could find themselves waiting for a very long time. 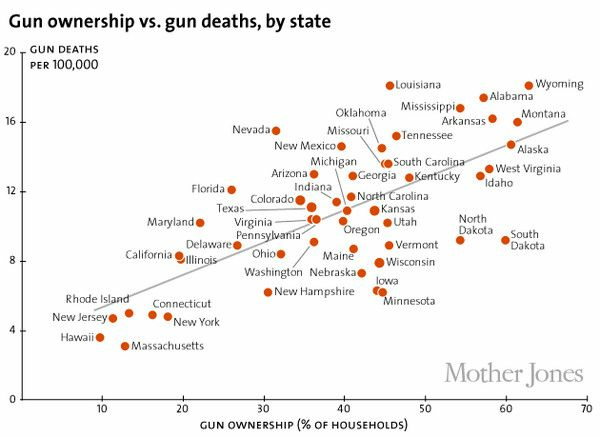 Using data from a study in Pediatrics and the Centers for Disease Control and Prevention, Mother Jones put together the chart above that shows states with more guns tend to have far more gun deaths. And it’s not just one study. 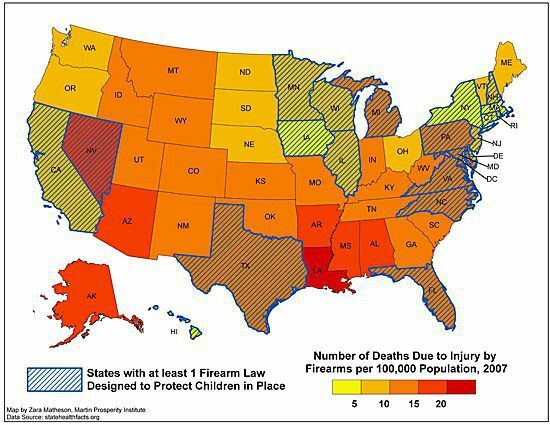 “Within the United States, a wide array of empirical evidence indicates that more guns in a community leads to more homicide,” David Hemenway, the Harvard Injury Control Research Center’s director, wrote in Private Guns, Public Health.